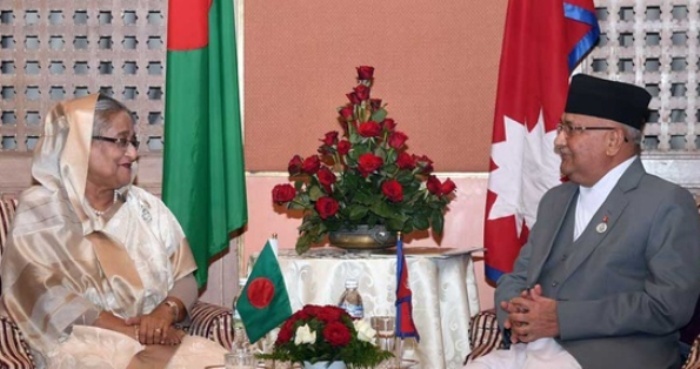 The consensus came at a bilateral meeting held between Bangladesh Prime Minister Sheikh Hasina and Nepalese Prime Minister KP Sharma Oli on Thursday at Hotel Soaltee Crowne Plazza in Tahachal Marg in Kathmandu. She said the main aim of the countries in this region, especially Bangladesh, is to eradicate poverty. "We don't want our own development only, we also want our neighbours to develop." In this connection, he mentioned the export of 500 megawatts of electricity to Bangladesh and said a Memorandum of Understanding (MoU) has already been signed in this regard. "According to the constitution, our parliament has been dissolved and the new government will take oath by October 31," said the chief adviser. Foreign Minister AH Mahmood Ali, PM's Principal Secretary Md Nojibur Rahman and Foreign Secretary Shahidul Haque were present on the occasion. Later, Sheikh Hasina along with other Bimstec leaders paid a joint call on Nepalese President Bidya Devi Bhandari at Sheetal Nibash, the Presidential Palace, in the capital city. They also attended a luncheon there hosted by the Nepalese President.